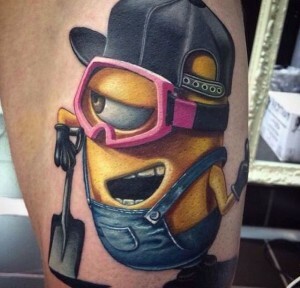 Welcome to the third edition of InkLocation’s Top 10 Tattoos of the week! 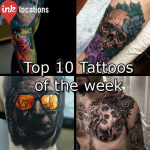 Here we will feature our top 10 favorite tattoos from around the world that were done in the last week – they are in alphabetical order to keep things fair! Once again, if you see an awesome tattoo you absolutely love that was completed during the next week – send it through to [email protected] to get it featured in next weeks edition! 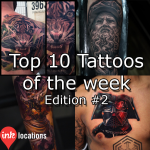 Welcome to the second edition of Inklocation’s Top 10 Tattoos of the week! If you see an awesome tattoo you absolutely love that was completed during the next week – send it through to [email protected] to get it featured in next weeks edition! 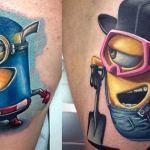 Welcome to the first edition of Inklocation’s Top 10 Tattoos of the week! Most stories about veterans focus on the difficult challenges many face, from unemployment and homelessness to the fact that more troops are living with severe injuries that ever before. But a new photo series focuses on their strength instead. The former soldiers pictured in the slide show above may be missing limbs, but they’re also amazingly fit, resilient, and moving on with their lives. The west coast of the United States is the birthplace of some of the types of tattooing that are most popular today, and it’s currently a very prevalent place for body art among the tattoo community. When we think of Los Angeles, California, we think of tattoos, thanks in part to shows like L.A. Ink, which bring the art of tattooing into the limelight. However, we might also get this association because Los Angeles has one of the highest number of tattoo shops per capita of any city in the United States. It’s also a city where many of the top tattoo artists flock to, meaning that there is a plethora of artistic talent to be found here, for the right price! Tattoos are a lifelong piece of art that you will carry all the way to the grave. As such, there is certainly a measure of responsibility that comes along with getting one! It’s important that the tattoo is well thought-out and well executed, but it’s equally important that you follow the proper tattoo aftercare guidelines, so it will be properly cared for in the very first few hours as well as the following weeks, until it’s fully healed. After all, you wouldn’t want to waste all the time and money that went into the creation of your tattoo by not taking care of it as it heals, right? Taking proper care of your tattoo in this beginning stage is crucial as it will maximize the quality of your tattoo for the rest of its life. Read our guide below to keep your new body art looking as vibrant as possible! The tattoo industry has enabled people to adorn their bodies with unique art for thousands of years, and there’s a reason it has endured as a trade for as long as it has. A tattoo is the only type of art that can be taken with you wherever you go, that can’t be lost or stolen, and that comes with you to the grave. A well-chosen tattoo can be a wonderfully personal and aesthetically appealing element to add to one’s appearance, so it’s important that when selecting a design that you’ll wear for the rest of your life, that it’s not something you regret! From the tattoo’s humble roots dating as far back as 4,000 B.C.E., spread through cultures in parts of the world all the way from Austria and Egypt to Polynesia and eastern Asia, the unique craft of adorning the body with permanent art has come a long way! Advancements in technology and travel, as well as global shifts in culture that have made tattooing much more popular over recent decades, have made enormous waves in the tattoo industry. These have resulted in the creation of dozens of art styles, which vary as much in their design as the countries do who pioneered them. Having a long tattoo session is one of the most difficult things about being tattooed. This is because getting tattooed is painful. It’s as simple as, the longer the time the longer the suffering is. But for those who really want to get their tattoo done, they won’t consider the time and pain anyway, as long as at the end of it they will get what they desired to have. The pain for a couple of hours is nothing compared to having a beautiful tattoo forever.